Cool blog, but I have one little correction. 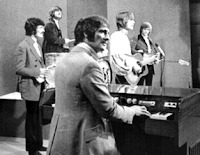 Actually, Michael Pinder was one of the founding members of the Moody Blues (along with flutist Ray Thomas), and co-wrote most of the songs on their first album (released in 1964) with original guitarist and lead vocalist Denny Lane. John Lodge (who was a pre-Moodies bandmate of Thomas and Pinder) and Justin Hayward joined the band in 1967. Pinder eventually left the group (or got the boot, depending on the side of the story) after he refused to participate in the reunion tour in 1978 with the release of Octave. Sorry to be a little persnickity, but the Moodies have always been one of my favorite groups. As for Badge, I didn't know that Cream used a mellotron in that song. I know that the effect in the bridge of the song came from Clapton playing through a Leslie speaker (and the title came from Ringo's awful handwriting of the word "bridge").